Present state: Demolished, but the part of the perimeter wall and the former entrance steps still remain. Notes: The original Lancashire & Yorkshire Railway terminus in Bradford was situated at Adolphus street, but the facilities were inadequate and inconveniently sited. 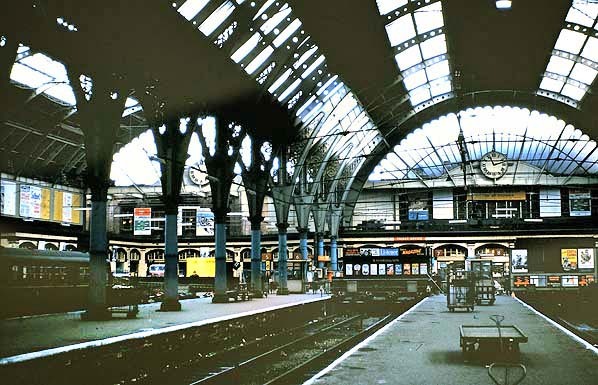 The station was closed to passengers in 1867 and the line was extended into Exchange station situated closer to the city centre near to the wool exchange, after which it was named. The new station was opened by the joint efforts of the Lancashire and Yorkshire Railway and the Great Northern Railway on 9 May 1850. 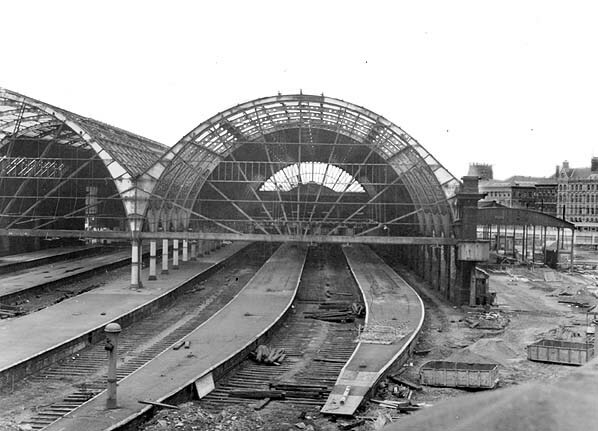 In 1867, the Leeds, Bradford and Halifax Junction Railway, which had previously used Bradford Adolphus Street, built a link to the tracks into Exchange station to join the two existing companies; Adolphus Street station was then closed to passengers. 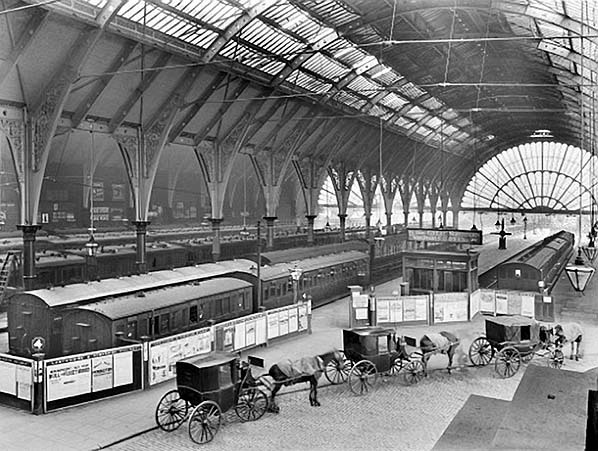 By the end of the 1870s, the station could not cope with the influx of passengers and it was completely rebuilt on the same site in 1880, with ten bay platforms and two arched roofs. Constructed of wrought iron, these rested at the outer sides on plain stone walls and classical corinthian style columns down the middle. Glass covered the middle half and timber (inside)/slate (outside) covered the outer quarters of each span. The four end screens were glazed in a fan pattern with decorative timber outer edging. The dimensions were a length of 450 feet , a width of 100 feet for each arch and a height of 80 feet, track to apex. The station never had a formal frontage; instead, passengers entered by an opening in the northwest side. Each company had five platforms which were operated independently from each other; crossing over meant using Mill Lane junction half a mile up the 1 in 50 gradient out of the station. There were two separate booking offices, an arrangement which continued until January 1940. 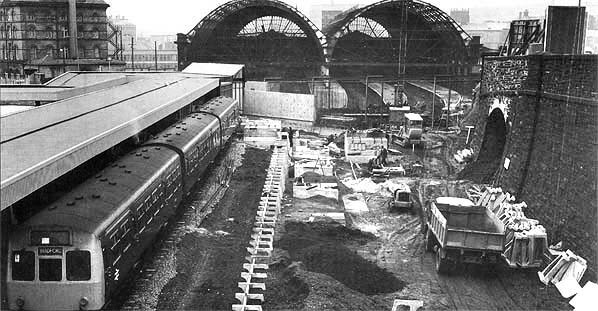 Passenger numbers dropped dramatically after WW2 and by 1973 the station, with its 10 platforms was deemed too large for the volume of transport using it. 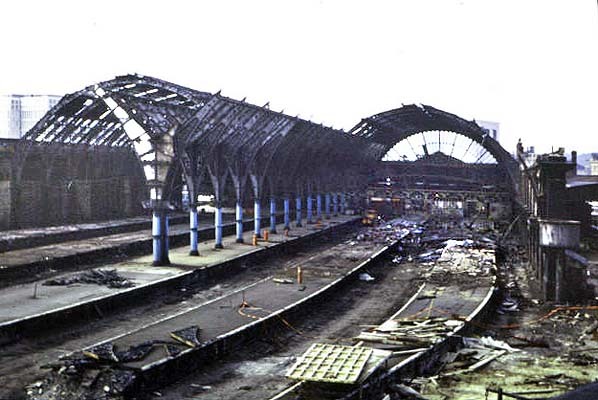 In 1973 the Bradford Exchange was closed and replaced by a smaller four platform station fifty yards south on part of the site of the Bridge Street goods depot which was demolished at the same time. 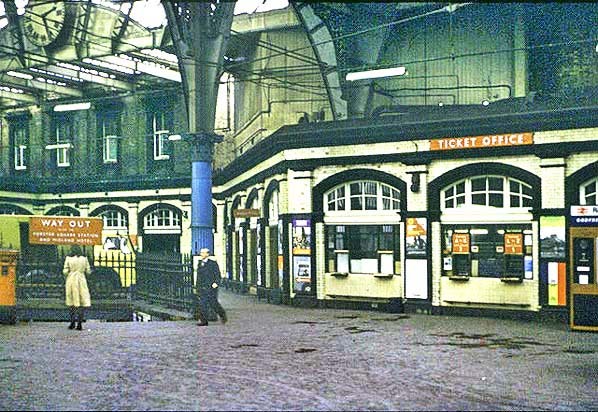 The old Exchange station was demolished in 1976 and the site was used as a car park. 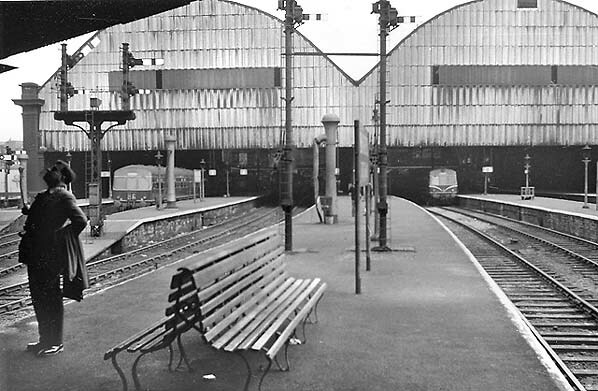 In 1977, a bus station was built alongside the new station, and, in 1983, it was renamed Bradford Interchange to link buses and trains in a covered environment. 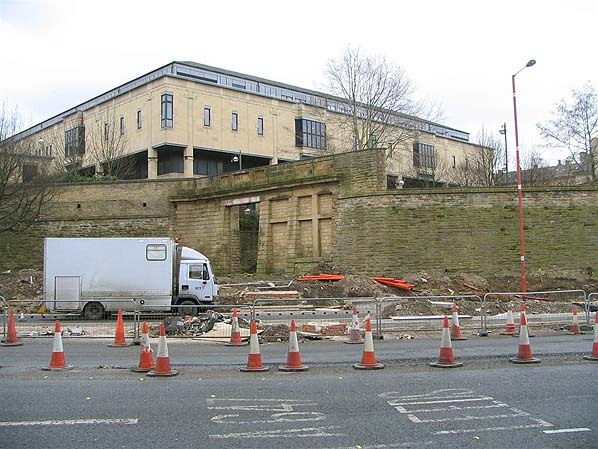 The site of Bradford Exchange now houses Bradford Crown Court and is due to be developed as a 'Justice Quarter' with new Magistrates' and Coroner's Courts. 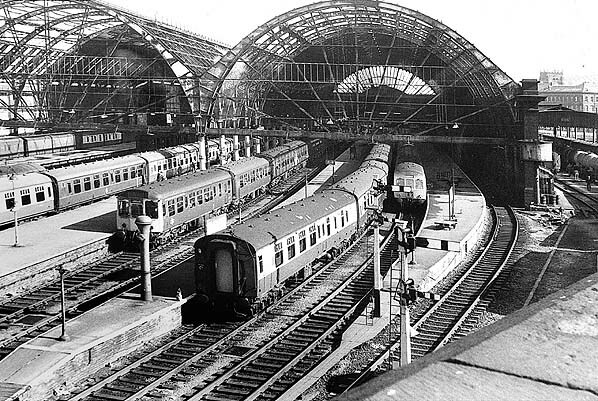 During the 1970s and 1980s, Bradford Interchange was considered the mainline station for Bradford with express services to London King's Cross, Trans-Pennine services to Liverpool and Newcastle and summer Saturday services to the South-West. The Inter-city services were moved to Forster Square station in 1992 when the line was electrified. 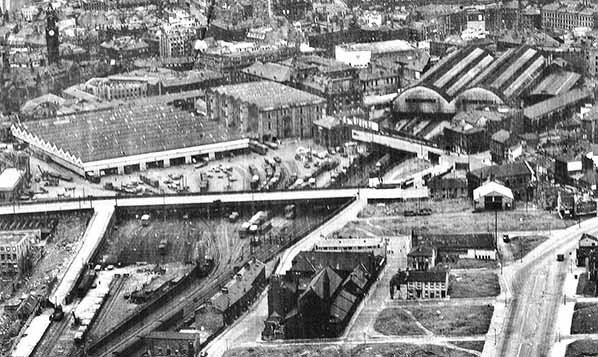 Bradford Exchange station and Bridge Street goods station in 1951. Click here for a larger version. 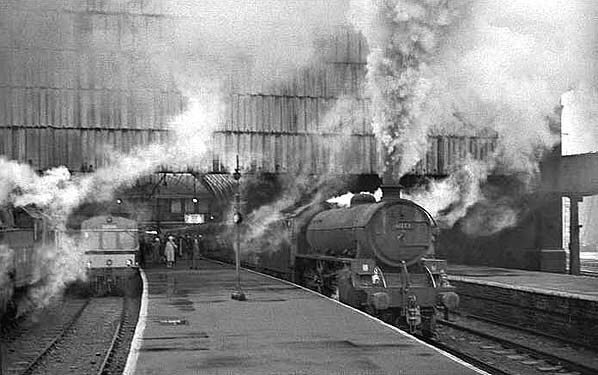 Looking north towards buffer-stops at Bradford Exchange station in April 1961. 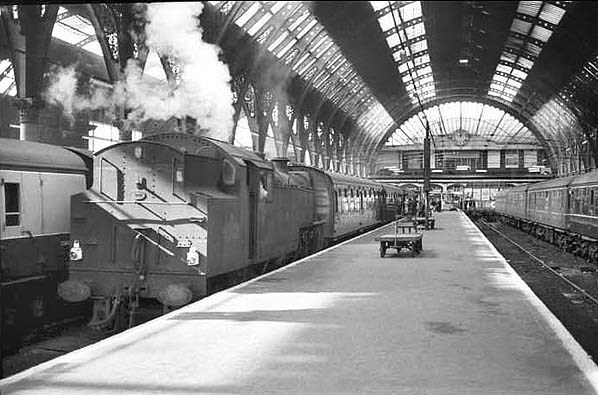 B1 4-6-0 no 61173 is about to take a train out of Bradford Exchange in the 1960s. Bradford Exchange in the 1960s. 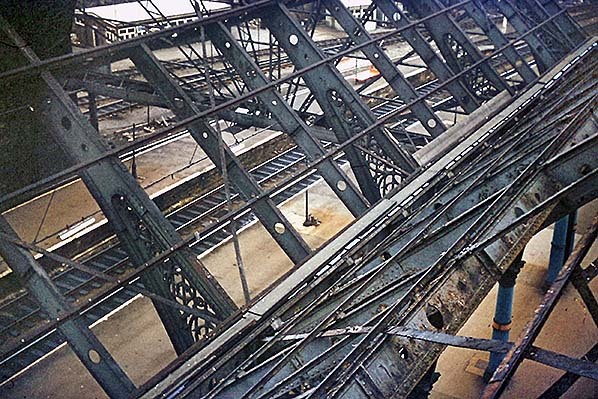 An unusual view of Bradford Exchange during a roof inspection in the mid-1960s. 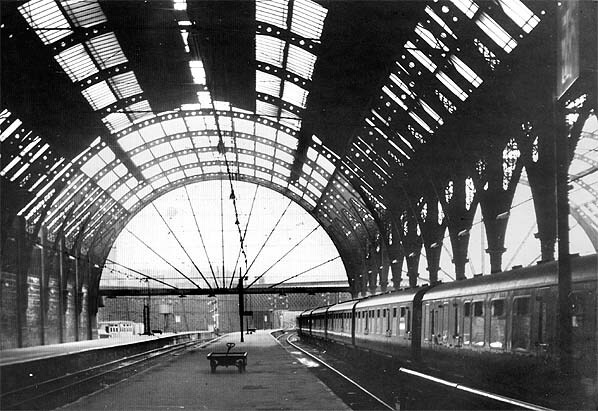 Bradford Exchange concourse in January 1973, shortly before closure. An entrance to Bradford Exchange Station still extant in January 2005. Bradford crown court is seen above occupying the site of the station.